The cash flow statement shows the cash moving into a business, called the inflows, and the cash moving out of a business, called the outflows. The statement of cash flows is divided into three categories, cash from or used in operating activities, cash from or used in investing activities, and cash from or used in financing activities. In our sample cash flow statement [amounts shown in thousands (000)] the cash from operations is a positive $498,000 for the period. This is a number you want to see grow. The cash used from investing is a negative $185,000 for the period. They purchased property, plant and equipment and sold an asset. The cash used from financing is a negative $302,000 for the period. They went into their credit line, used a long-term loan, and they paid a dividend. The $83,000 cash at end reconciles to the cash line of the balance sheet. You can see right away that there is a lot of useful information in the cash flow statement. 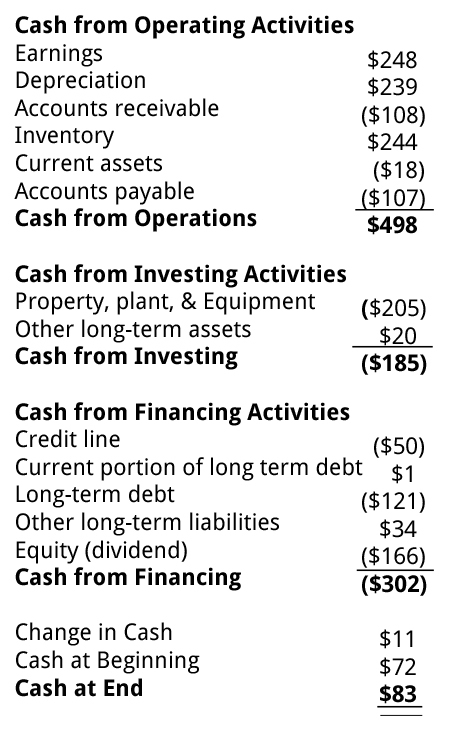 The first category shows operating cash flow, which in many ways is the single most important number indicating the health of a business. A company with consistently healthy operating cash flow is probably profitable, and it is probably doing a good job of turning its profits into cash. A healthy operating cash flow, moreover, means that it can finance more of its growth internally, without either borrowing or selling more stock.